French Catholic émigrés established Savannah’s first parish, called the Congrégation de Saint Jean-Baptiste, shortly before the end of the 18th century. They came to Savannah in the aftermath of an uprising in Haiti. Among them were nobles fleeing the French Revolution that had begun in 1789. The congregation grew through the addition of immigrants, and on May 30, 1799, the Mayor and Aldermen of Savannah passed a resolution reserving half a trust lot on Liberty Square for the congregation’s use. One year later to the day the cornerstone was laid for the small frame church of Saint John the Baptist. In June 1804, the congregation had begun to experience growing pains and petitioned the city for an extra lot, but since none was then available, the petition was rejected. On August 2, 1811, however, the Mayor and Aldermen of Savannah granted a petition for a larger parcel of land nearby, at Montgomery and Hull Streets; the proposed new church was never built on that property. Rather, the congregation chose a site on Drayton and Perry Streets. All of Georgia became part of the Diocese of Charleston when it was established in 1820, under Bishop John England. In 1835, Bishop England placed the cornerstone of the new church between Perry and McDonough Streets. It was constructed of brick and seated 1,000 people. On April 1, 1839, Bishop England dedicated the Church of Saint John the Baptist. The parish at this time included about one-third of the Catholic population in the state of Georgia. Pope Pius IX erected the Diocese of Savannah on July 19, 1850, as had been requested by the Seventh Provincial Council of Baltimore in May 1849. At its creation, the diocese included all of Georgia and most of Florida, with a total Catholic population of 5,500 Catholics. The first bishop of Savannah was the Rt. Rev. Francis X. Gartland. The Church of Saint John the Baptist, then the only Catholic church in Savannah, became the Cathedral. Bishop Gartland enlarged the building with an addition measuring 25 by 60 feet, and repaired the hurricane-damaged roof. He rededicated the Cathedral on June 26, 1853. In 1870, Pope Pius IX appointed the Right Reverend Ignatius Persico as the fourth bishop of Savannah. The diocese now covered just the state of Georgia, and had 20,000 Catholics and 30 churches. Bishop Persico inaugurated plans for building a new Cathedral. He secured the grounds for the planned Cathedral from the Sisters of Mercy, who owned a parcel of land adjacent to Saint Vincent’s Academy on Abercorn Street, running back along Harris Street to Lincoln Street. In exchange for this land, the Sisters received from the diocese a lot of the same size at East Taylor and Lincoln Streets. Bishop Persico resigned the see for reasons of health in 1872. He died a cardinal in 1895. Bishop Persico’s successor, the Right Reverend William H. Gross, C.Ss.R., laid the cornerstone of the new Cathedral on November 19, 1873. The new structure was dedicated to “Our Lady of Perpetual Help,”a name the Cathedral retained for about ten years. On April 30, 1876, the Most Reverend James Roosevelt Bayley, Archbishop of Baltimore, dedicated the new brick Cathedral, which was of French Gothic style with imposing nave and transepts. Bronze-colored iron columns supported triple rows of groined arches. The main altar and four side altars were designed by Baldwin & Price of Baltimore and crafted of white Italian marble. Bishop Gross was transferred and his successor, the Right Reverend Thomas A. Becker, sixth bishop of Savannah, discovered during a pilgrimage to Rome that the Vatican had never formally approved the Cathedral’s change in name; indeed, the Holy See directed that the parish resume the title of Saint John the Baptist with Our Lady of Perpetual Help as a secondary patron. Bishop Becker completed the Cathedral with the building of the spires in 1896. The brick structure was also stuccoed and whitewashed. On July 29, 1899, during the work of reconstruction, Bishop Becker died while visiting the Catholic boys’ orphanage in Washington, Georgia. Father Benjamin Keiley was soon appointed the seventh bishop of Savannah. He presided over the first Mass celebrated in the rebuilt Cathedral on December 24, 1899, in the basement chapel. The rebuilt Cathedral of Saint John the Baptist was dedicated on October 28, 1900, by Archbishop Sebastian Martinelli, apostolic delegate to the United States. Under the direction of Father G. F. X. Schadewell, rector, the Cathedral was redecorated and murals were installed. The stained glass windows, executed by the Innsbruck Glassmakers in the Austrian Tyrol, were installed in the Cathedral around 1904. Christopher Murphy, a noted Savannah artist, planned and directed a firm of artists in the painting of the murals. The refurbished Cathedral was formally re-opened in May 1912. Bishop Keiley achieved a long-desired wish when he presided over the solemn consecration of the Cathedral in 1920. In those days, a church might be dedicated and used for service before its debt had been cleared; it was consecrated only after it was debt-free. The tenth bishop—the Most Reverend Thomas J. McDonough, aided throughout by Monsignor T. James McNamara, rector—undertook another major renovation between 1959 and 1963. Among the changes were the wide plaza at the entrance; modern heating, cooling, and lighting systems and a new pulpit and altar rail. The color scheme was chosen to resemble that of the church before the 1898 fire. 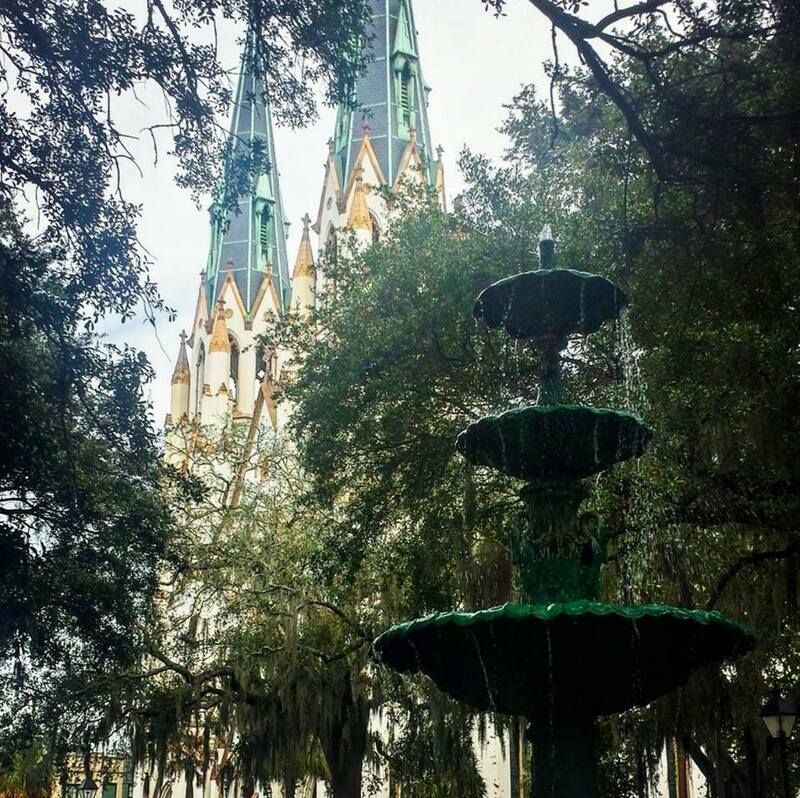 The twelfth bishop of Savannah, the Most Reverend Raymond W. Lessard, appointed by Pope Paul VI in 1973, undertook a repair of the Cathedral in 1984-85, when a shift in the spires indicated a settling of the foundation. The church was closed while the decaying timber foundations were removed and replaced by reinforced concrete. In keeping with the reforms of Vatican Council II, changes were made to bring the Cathedral into line with new liturgical norms. The high altar became a backdrop for the liturgical functions, while the new altar allowed the celebrant to face the congregation. The Most Reverend J. Kevin Boland, the thirteenth bishop of Savannah, announced a major restoration project for the Cathedral in September 1998. Father William O. O’Neill, rector since 1996, was placed in charge of the project, which involved the removal, cleaning and re-leading of over 50 stained glass windows, the replacement of the slate roof and the restoration of the interior in keeping with the architectural integrity of the building. The project was completed in November 2000, in time for the celebrations of the 150th anniversary of the diocese and the 100th anniversary of the rededication of the Cathedral in 1900.